As we have noted in a series of posts on Just the Facts, there is a trend throughout Latin America of increasingly using militaries to carry out law enforcement duties. Each state in Brazil has two distinct police units – the Civil Police and the Miltiary Police (PM). The PM is responsible for maintaining public order and immediately responding to crimes, while the Civil Police carry out investigations, detective work and forensics. Although the PMs are military-trained and also army reserve troops, they report to their state governments, not the Ministry of Defense. There are about 400,000 active PM members and 123,400 active members of the Civil Police. Today, almost all urban policing in Brazil is done by military police attached to the governments of each state, and the country remains the only one in the world to have a police force that operates out of the military barracks. The issue of demilitarizing the police has reentered the debate in Brazil after several recent episodes of PM violence against demonstrators and journalists during the massive protests that swept the country in June. A survey by BBC Brasil on police killings in 2011 indicated that São Paulo’s PM killed six times more people than the Civil Police. Wilson Moraes, president of the Association of Chiefs and Soldiers PM from São Paulo, Brazil told the BBC that associations of PMs are favorable to the unification of the police – among other things because it would allow for the political participation of the military in society and make it possible for them to receive overtime. In 2012, the UN Council on Human Rights asked the Brazilian government to work towards abolishing the PM, as they have been accused of numerous extrajudicial killings and abuses. Other global organizations have also spoken out about the PM for their involvement in death squads. Last year Amnesty International reported PM and Civil Police had been, “engaged in social cleansing, extortion, as well as in trafficking in arms and drugs,” as well as in enforced disappearance. The U.S. State Department’s Country Reports on Human Rights have also recognized these abuses. the police and the military, the latter of which has been accused of having entire branches that function like drug trafficking organizations. Critics of Plan Patria Segura, or the “Safe Homeland Plan,” say the only thing it has done is militarize the country, pointing to some data that indicate June was one of the most violent monthsin 2013. For its part, the Venezuelan government says it is making progress and that the opposition and media are attempting to delegitimize the government by magnifying the crime rate. The “Safe Homeland Plan,” or “Plan Patria Segura,” is part of Venezuela’s “Full Life Mission,” an anti-crime initiative launched under President Chávez in June of last year that had a budget of over five billion bolivars (US$ 1.16 billion) for its first year, according to the Venezuelanalysis blog. Marino Alvarado, director of human rights organization PROVEA (Programa Venezolano de Educación-Acción en Derechos Humanos), has noted that Plan Patria Segura goes against the philosophy of the mission, which promoted the armed forces “should only act under exceptional circumstances and not be used to for public order.” According to the BBC, it is the 21st citizen security plan since 1999, when Hugo Chávez first took office. On May 13, the Venezuelan government sent 3,000 members of the Bolivarian Armed Forces (FANB) to the streets of Caracas, marking the start of Plan Patria Segura. The country’s minister for justice and internal affairs, Miguel Rodriguez, said the first phase of the plan was “designed to last “around six months,” at which point the soldiers would be replaced with police and members of the National Bolivarian Police. So far, according to some government numbers, about 40,000 soldiers have been deployed. In total, 80,000 troops will be deployed and the military will have a presence in every state in the country. In early July, 1,541 troops were sent to the Guárico state in northern Venezuela and on July 1, President Maduro announced on his Twitter account that there would be a “new stage” of the plan, which included increasing the amount of troops and implementing “intelligent patrol,” which means units now assigned to territories of about a square kilometer will use GPS technology.He also ordered more troops be sent to the Miranda state, which he claimed has double the rate of crime compared to the rest of the county. Most recently 30,000 troops were deployed to the Amazonas, Apure, Portuguesa, and Nueva Esparta states on July 15. Impunity: Deploying military to the streets does nothing to address the issue of high rates of impunity for criminals. The Economist reported in January of this year that there was 96% impunity for homicides. Human rights training: In 2008, as an attempt to move away from a militarized police force, former President Hugo Chávez created the National Bolivarian Police (PNB) to create a “preventative, professional, and non-militarized citizen security force.” Before the reform, the National Guard was responsible for training the police. The PNB officers now receive training with an emphasis on human rights and deferential force from a civilian-run policing university. As the crime rate continues to climb, citizens and other police officers have accused the PNB of being “soft” for their less aggressive tactics.Deploying the military, which receives no such training, to high-crime areas gives weight to the notion that repression is more effective. Human rights organizations worry the military is not ready to handle law enforcement in a humane way. Such criticism arose recently after three people were killed in two states by the National Guard. Lack of oversight: There are no mechanisms through which citizens can regulate military corruption or abuses against themselves or other citizens. The military and National Guard are not subject to the oversight bodies created by the policing university, the General Police Council and new policing laws. In some states there are citizen-run police oversight committees — some police officers have even expressed concern that the military may commit abuses against detainees and are worried that in the event abuses occur that the police would be blamed, once the detainee is transferred. However, this is not to say that the reform has been a success. Although there has been an ongoing police reform since 2006, the notoriously corrupt force has been consistently accused of extrajudicial executions, torture, involvement with organized crime and kidnapping. Earlier this month, Transparency International published a report on worldwide corruption, which found the police to be considered the most corrupt entity in Venezuela. Since President Nicolas Maduro took office in April, he has criticized police forces throughout the country, calling the police in Caracas “mafiosos,” alleging they were responsible for 90 percent of the kidnapping in the capital. He also has demanded several forces be investigated for corruption, and has called the force in Amazonas “a disaster,” after announcing it would be investigated for criminal activity. Militaries are getting involved in policing throughout Latin America. Adam talks to Sarah Kinosian of the Center for International Policy, who wrote a series of posts to the Just the Facts blog documenting this trend in Guatemala, Honduras, and Venezuela. 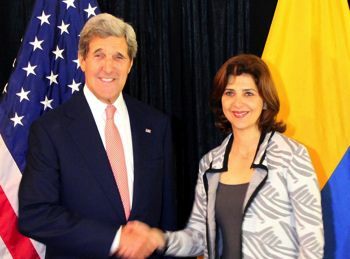 John Kerry is about to make his second trip to Latin America as secretary of state. The first was in June, when he attended the OAS General Assembly meeting in Guatemala. This time, he is to go to Colombia on Sunday and Monday, and then to Brazil. In Colombia, Secretary of State Kerry is expected to discuss with President Juan Manuel Santos the ongoing peace talks with the FARC guerrillas, for which the Obama administration has expressed support; the issue of security and Colombia’s provision of security assistance to third countries; and the state of bilateral trade two years after approval of a U.S.-Colombia free trade agreement. From his 1998 book The New War, where he characterized drug cartels as a principal threat. A study by Somos Defensores, a non-governmental protection program for human rights defenders, reveals shocking growth in murders of Colombian human rights defenders. The number of murders, although still high, remained relatively consistent around 30 per year between 2008 and 2011. But in 2012, the year after Colombia’s government passed a land restitution law encouraging displaced victims to come forward and claim stolen property, the number more than doubled to 69. 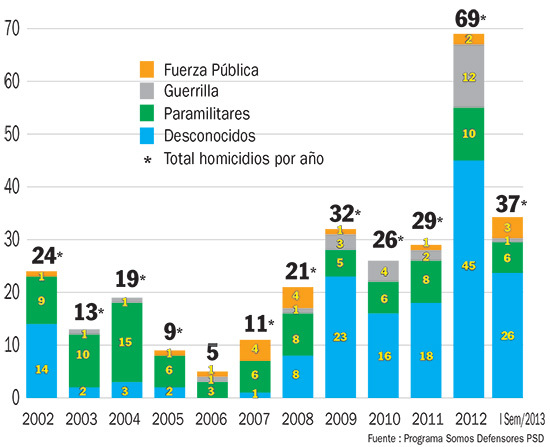 The chart posted here, compiled by the Colombian newsmagazine Semana, puts the horrifying jump in context.